About four hundred thousand years after the Big Bang, the universe settled into a pretty dull period in its history. There were no stars or galaxies, just one massive expanse of neutral hydrogen, sitting in the dark. This period in the universe’s history, known appropriately as the Dark Ages, came abruptly to an end when the first stars were born and began to shine, dumping loads of high energy photons into their surroundings. These photons created ‘bubbles’ of ionised hydrogen around the stars, which slowly grew as more photons were pumped out by the stars. The bubbles surrounding the first stars were pretty small, but later, as stars began to group together into the first galaxies, these bubbles were blown much bigger by the combined photons from all the stars in the galaxy. Over time the bubbles from neighbouring galaxies began to overlap, until eventually all of the hydrogen in the universe was ionised (see Figure 1). This process is known as reionisation (Astrobites has written plenty about reionisation in the past – for more background, go check out some of these articles), and it’s a key period in the universe’s history. The subject of today’s bite are these ionised bubbles, the baby galaxies that blew them, and how much they contributed to reionisation. We will see that there is a close relationship between the properties of a galaxy and the size of the bubble it can blow. The size of the bubble also affects how easily we can see the galaxy. Finally, we’ll also learn about two upcoming observatories that it’s hoped will be able to see both the bubbles and their galaxies at earlier times than ever before. Figure 1: A timeline showing the beginning of the Dark Ages (at recombination), and its end when the first stars and galaxies were born, ionising nearby hydrogen. These ionised bubbles soon grow and overlap, until the majority of the Hydrogen in the universe is ionised – this period is known as the Epoch of Reionisation (source: Nature 468). Who blew all the bubbles? One burning question researchers would like answered is ‘What kinds of galaxies contributed the most to reionisation?’ Many researchers in the field assert that it was small galaxies; they tend to allow their ionising photons to escape much easier than massive galaxies as they have less gas to get in the way. There are also far more small galaxies than big ones: more galaxies, more high energy photons, more reionisation! Unfortunately, such small galaxies are typically harder to detect than their big cousins since they’re less luminous. Figure 2: size of ionised Hydrogen bubbles (RHII ) plotted against the luminosity of the Lyman-alpha emission (LLyα ). The bigger the bubble, the stronger the emission. This relationship doesn’t change much with redshift. That’s not to say that finding small galaxies is impossible. In the early universe, galaxies tend to be creating lots of new stars, and these young stellar populations emit light with a strong hydrogen spectral line, known as Lyman Alpha. Using Lyman Alpha, Astronomers hope to be able to see the small galaxies that contribute to reionisation in a big way. Unfortunately, as it’s so energetic, Lyman alpha radiation is absorbed by neutral hydrogen. So how can we detect it before the universe was ionised? The trick is to choose galaxies that have blown large bubbles. Galaxies with large enough bubbles allow any newly emitted ionising radiation from the galaxy to travel far enough uninhibited through the bubble to become redshifted. Redshifted Lyman Alpha radiation doesn’t have enough energy to ionise the neutral hydrogen outside the bubble, so it can happily continue travelling all the way to our telescopes on Earth, 12 billion light years away. So now the question is, what galaxies blow the biggest bubbles? The authors of today’s paper use a simulated model of the early universe to investigate this. Figure 2 shows the predicted size of ionised bubbles against the luminosity of Lyman-alpha. There’s a strong correlation between bubble size and luminosity. So… what galaxies emit the most Lyman Alpha? The bottom left panel of Figure 3 shows the relationship between Lyman Alpha luminosity and stellar mass. There is a clear correlation between the size of a galaxy and the amount of Lyman Alpha radiation it’s pumping out. 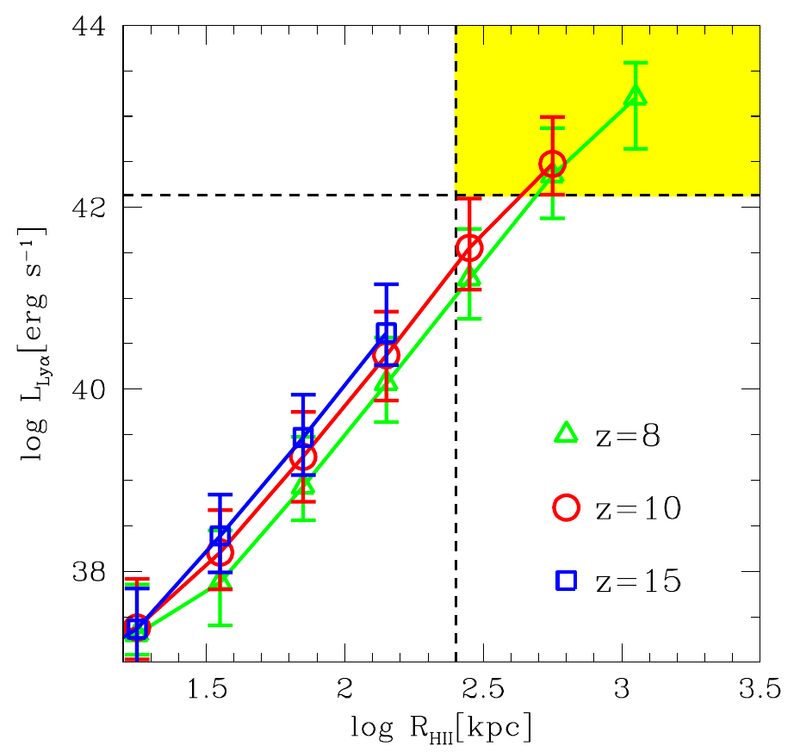 Figure 3: The relationships between bubble size and Lyman Alpha luminosity (y axis, top and bottom respectively) with stellar mass and star formation rate (x axis, left and right respectively). The different coloured lines are for different redshifts. The biggest galaxies emit the most Lyman Alpha, and therefore blow the biggest bubbles. 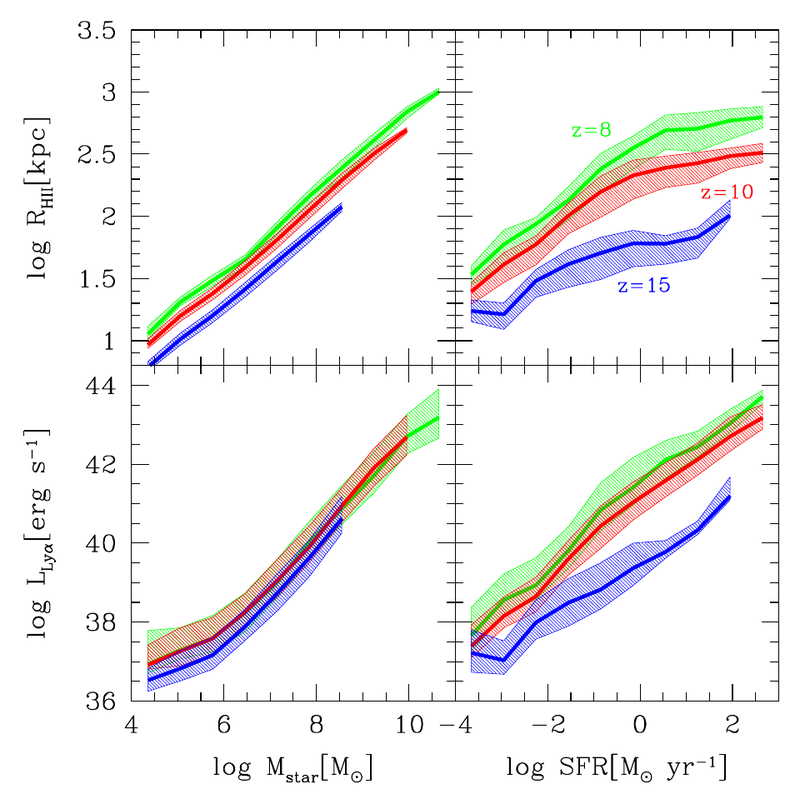 The link between bubble size and star formation rate is not as strong. What does this all tell us? For a start, the model seems to suggest that we won’t be able to see the very smallest galaxies at very high redshifts using Lyman Alpha. All is not lost, however: thanks to two upcoming observatories, we may still be able to see the most energetic LAEs and their bubbles at redshifts of around 10, much higher than we’ve ever seen them before (The most distant LAE found to date is at z ~ 8.6). The first of these new observatories will be the James Webb Space Telescope (JWST), an enormous space based telescope scheduled to launch in 2018. It will be capable of detecting Lyman Alpha radiation out to very high redshifts: the horizontal line in figure 2 shows the expected sensitivity of the instrument, within range of the most luminous Lyman Alpha emitters at z ~ 10 according to the model. The second of these enormous observatories to come online will be the Square Kilometer Array (SKA), a truly enormous radio telescope array based in both South Africa and Australia. It will be able to ‘see’ neutral hydrogen, leaving the ionised hydrogen bubbles to stand out like holes in a cheese. The vertical dashed line in figure 2 shows the smallest bubble size that it’s hoped the SKA will be able to see, again well within the range of the biggest bubbles at z~ 10. Combining these observatories, the yellow region in figure 2 represents those galaxies with bubbles are that are big enough to be observed with the SKA, and that allow enough Lyman alpha escape to be picked out by JWST. If the model is correct, these will be the most distant LAEs observed, and the first ever detection of ionised bubbles. But the smaller galaxies, thought to be responsible for the majority of reionisation, will have to wait for future generations of humongous space and ground based telescopes to be detected.